Claire comes from a very wealthy family and it is expected that she will be just like her mother and sister–into fashion, shopping, and attending all sorts of events. However, she wants nothing to do with this lifestyle and instead is really into music. In high school, she meets Jared, an extremely talented guitarist and songwriter, and he teaches her to play guitar and they begin to write songs together. When they start dating and Claire brings him home to meet her family, her parents are not at all impressed. They want Claire to be dating a boy destined to go to an Ivy League school, not a boy from the local public school who has no intention of going to college. When Claire’s mother is diagnosed with terminal cancer, she begs Claire to break up with Jared. Since Claire wants to please her dying mother, she does exactly this. What she didn’t expect was that Jared would move to New York, get a record deal, and win a Grammy for the songs he wrote that basically bash his ex-girlfriend. I really liked this one! It is actually a retelling of Jane Austen’s Persuasion, which I haven’t read but definitely need to. Claire’s parents are the cliche snobby rich parents who are disappointed in their daughter for not being exactly like them, and they immediately think the only reason she is with Jared is to rebel against them. They don’t realize how much she actually cares about him, or how hard it was for her to end their relationship. I appreciated that Claire loved her mother enough to give up Jared for her, but at the same time it was really unfair of her mother to even put her in that situation. So Jared goes off to New York and basically pulls a Taylor Swift on Claire, which is totally not cool. Instead of listening to her or trying to figure out the real reason behind the breakup, he runs away. They were definitely both at fault–Claire for not explaining what was really going on, and Jared for not listening. And instead of answering her phone calls, Jared writes a bunch of songs about how horrible his ex-girlfriend was and they end up being chart toppers. Right away, I didn’t like Jared because he seemed like a jerk after all of this, but he definitely grew on me throughout the book. Claire ends up having to spend the summer working at the beach while her family vacations there. When Jared turns up, staying with his friend who is Claire’s cousin’s best friend, the two are thrown together again after everything that happened between them. The two have this whole back and forth thing, going from hating each other to obviously still not being over each other and back again. I really liked Claire’s personality, and the way she would take little jabs at Jared that only he would understand. She definitely doesn’t let him back into her life easily, which is totally understandable. Overall, Another Little Piece of My Heart was a cute love story that I definitely enjoyed. The ending was a bit lacking, because it ended pretty abruptly and I would’ve liked to have seen more of what happened after. 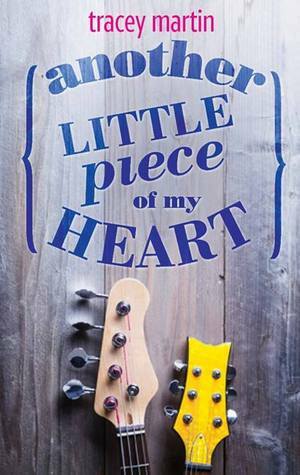 Another Little Piece of My Heart was released on December 1, 2013.